This raises the question of whether the signs of ageing can be reversed, or is it just something we should accept as an inevitable part of life? Before we talk about how to reverse the signs of ageing, we need to understand the difference between ageing that is caused by natural factors, and ageing that is caused by environmental factors. The natural ageing process is actually genetic and is a result of programming, which dictates that we age in a certain way. Natural ageing counts for about 10% of the ageing process and usually starts to show when we are aged between 50 and 60. During the natural ageing process, the face tends to fall down, causing fine lines and wrinkles around the eyes, lips, and around the nose. And what were once character or expression lines around the forehead, or eyes become more deeply entrenched and form wrinkles. Environmental ageing depends on our lifestyle habits and can start having an effect on our appearance starting from around age 30. Things like sun exposure, poor diet, smoking, and drug use have the most impact on environmental ageing, which represents around 90% of the ageing process. In Australia, we need to be particularly careful of the sun. Not only is it one of the biggest causes of skin cancer, it also has an effect on the way our epidermis renews skin cells, causes a thickening of the skin, and can lead to the appearance of solar keratosis, or sun spots. It is obvious then that maintaining a healthy lifestyle when you’re younger is the secret to successful ageing. 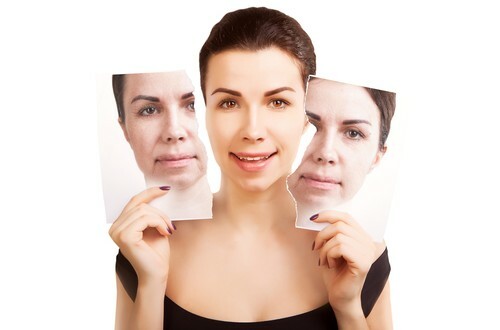 However, these days, there are a variety of non-surgical procedures that can improve the appearance without changing it too much and help you to age gracefully. New technologies in laser treatment mean lasers are far more effective than they used to be. At Taylor Clinic, we offer a range the latest laser technology available in the market, to target each patient’s individual needs. PicoSure FOCUS’ is one of the lasers available at Taylor Clinic, which presents a unique mechanism of action that has shown results similar to non-ablative and even ablative lasers (however, without the preparation time, patient discomfort or downtime). Other fractionated lasers, ablative lasers and IPL treatments are also available. Ultherapy is a non-surgical facelift procedure that uses medical ultrasound to counteract the ageing effect of gravity. It works by stimulating the growth of collagen below the skin’s surface without harming the outer layer of skin. The result is firmer skin with a reduction in fine lines and wrinkles, a more defined jawline, and a lifting of the brow line to reduce drooping around the eyes. Ultherapy is a non-surgical procedure, but it gives you a more youthful appearance after just one treatment. Anti-wrinkle injections are an anti ageing treatment that has become very popular in recent years. It reduces the appearance of fine lines, particularly around the upper areas of the face. It works by slowing the transmission of messages between nerves and muscles, which paralyses the muscles that cause lines and wrinkles to form. It’s mostly used in the forehead and around the eyes to reduce the appearance of crow’s feet. It is also useful for lifting the eyebrows. Threading is a very popular alternative for those looking for a quick and non-invasive alternative to the traditional facelift. During a threading procedure, threads containing microfilaments of polylactic and glycolic acids are placed in areas of the face that are prone to sagging, like the jawline, cheeks, eyebrows and neck. The threads tighten the skin for immediate results. Then over the long term as the skin absorbing the polylactic acid filaments, its own natural collagen becomes stimulated, giving the skin a more youthful ‘plumpness’. This process is used to treat static wrinkles and folds by being placed below the skin’s surface to literally “fill in” or “plump up” the wrinkles or folds. Static Wrinkles are visible when your face is at rest. As the body ages, skin loses its elasticity and volume. Dermal fillers are injectable products that are placed beneath the skin’s surface to fill and therefore diminish the depth of facial folds and wrinkles or to provide additional natural looking fullness and definition to areas such as the cheeks and the lips. If you’re interested in finding out more about any of these anti ageing treatments or need some advice on how to combat the signs of ageing, call Taylor Clinic on 1300 003 223 or click here to book an appointment.